Find your perfect pet in this animal shelter clip art set! This collection contains 34 images in total - 17 black and white and 17 color versions. It would be fantastic for use with a community helpers theme, a pet theme, or just when teaching lessons on social responsibility and compassion. 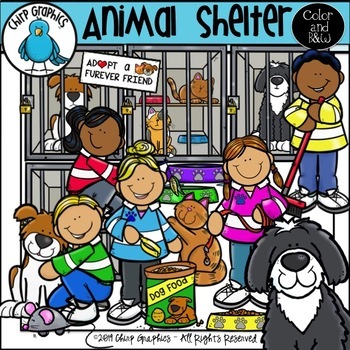 **Get this Animal Shelter set for a fantastic discount HERE as part of my super saver Community Helpers Clip Art Bundle! ©2019 Chirp Graphics. All Rights Reserved. Do you like freebies, contests, and getting things on sale? Connect below!